After tasting my last pot roast, my Main Squeeze said, with a faraway look in his enormous brown eyes, "You know, you could learn daube...the flavor is different, but the consistency is the same." Such an insight couldn't go unheeded, and my in-laws were coming for the holidays, so I had my mission. But first I had to learn how to spell it. This recipe is Iraqi, and as Mama pointed out..."nobody makes this but Iraqis!" but the spelling of the word is French. I investigated to make sure I didn't call a pie a cake, and since a "daube" by definition is a stew made of red meat, I'm pretty sure I got it right. However, unlike this recipe, the French ones added veggies and the like to the pot. A few tactical notes before beginning: One of my favorite places to get fresh, good quality leg of lamb is at a small local meat market, often located inside Middle Eastern grocery stores. The butcher will reserve a leg of lamb for me if I call ahead, and will trim much of the excess fat (a time consuming process) while I wait. The bummer is that you have to pay for the pre-trimmed weight, so shop around to get a good value. 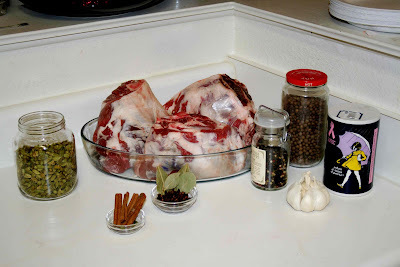 Beef is much more economical, but I'm still searching for a good way to get a lean piece of beef that will hold up to the long cooking time and that includes bone and marrow. Suggestions? 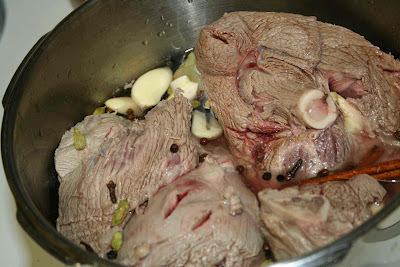 Add salt after the daube has boiled for an hour, which will enable it to tenderize properly. Add the tomato paste when there is about an hour before serving. I think adding the tomato paste towards the end helps keep the tomato flavor intact. 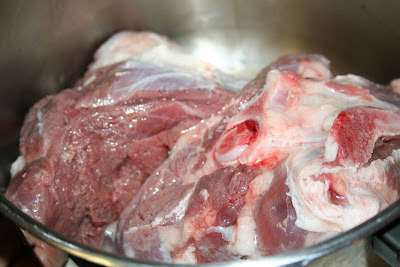 Wash and trim excess fat and silver membrane from the leg of lamb. 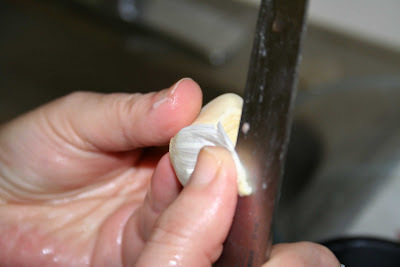 With a long, thin, sharp knife, gouge a deep hole into the meat for each garlic clove you'll later insert. 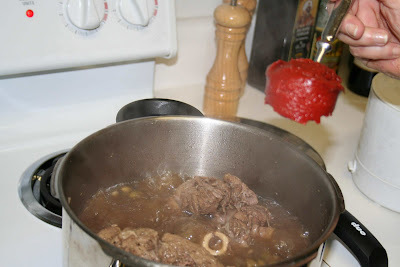 Arrange pieces of lamb in dutch oven. Shown here is a pressure cooker, but we didn't pressurize this recipe. I suspect this would be a great crock pot recipe, and will post and update after trying. 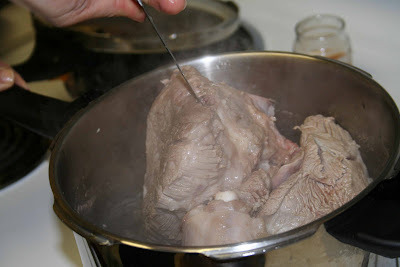 Fill the pot with water to within 1 1/2 inches of the top of the meat. Cover and bring to a boil. 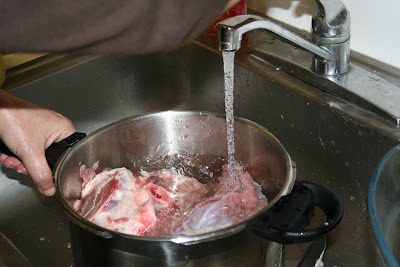 Remove pot from heat, discard water, set the lamb aside, and scrub the scum out of the pot. 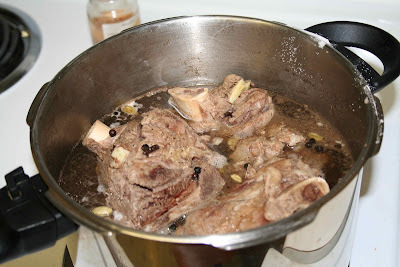 Mama chooses to do this, despite some people's assertions that it weakens the flavor of the lamb. I initially was on the side of NOT throwing out the first boil, but after tasting the final product, decided the flavor was plenty fantastic, and there indeed was less meat scum to deal with. Meanwhile, peel 9-10 garlic cloves. 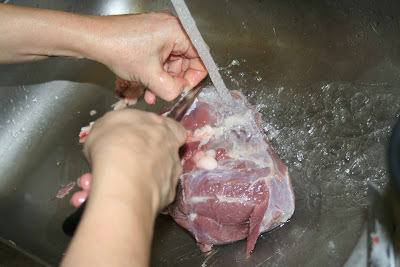 After discarding the water, return the meat to the pot and push the garlic down into the knife holes made previously. Widen the holes if necessary. Put the spices and the rest of the garlic into the pot, cover, boil hard for about 1 hour, then add salt. Add tomato paste and simmer 1-2 more hours until you're ready to eat. Serve hot over basmati rice with salad. 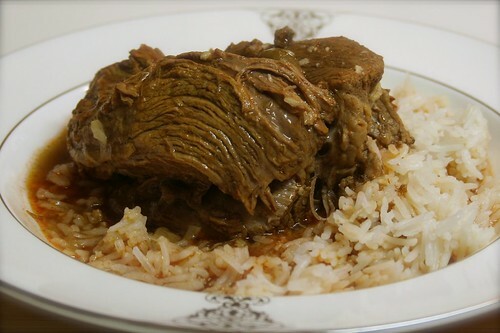 Note: when eating Iraqi daube, there's nothing wrong with partaking of the delicate juiciness of marrow and cartilage, that is, if you're lucky enough to get your hands on a piece of the bone! True confession: when it came time to eat the daube, we dove in like little piggies before taking any photos. So the photo you see at the top is from my second try. Um, I do that all the time. Cook something that's really pretty and am so starving, I dive in, completely forgetting to take pics until my beautiful creation is destroyed. That just means you'll have to make it again! Thanks for souch a wonderful blog! The whole family loved this recipe! Thanks so much for taking the time to post. Just wondering, do you have the recipe for large kubba or Kubba Mosul? I have asked, searched w/o any luck!!!!!! One question: Do you have the recipe for Large Kubba or Kubba Mosul? I have searched, asked w/o any luck!!! Regards and thank you for all you do, Anne. Hi Anne! I'm so glad you liked this recipe! I don't have the recipe for kibbe Mosul, which is a bummer because I've been told that until I master that recipe I'm not a full-fledged Iraqi cook. :o) For now, these will have to do. Good luck in your search...your best bet is to find someone who knows how to do it and shower them with compliments until they let you watch (and learn!). Thanks for your kind comment, and have a great day.